Hello from Singapore! I’m in the middle of a review trip. 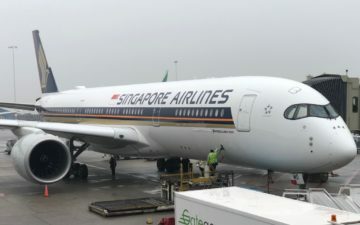 After flying from San Francisco to Melbourne in Qantas’ 787 business class, I connected from Melbourne to Singapore in Singapore Airlines’ 777 first class. I’ve flown Singapore first class many times before, though not this specific product — I’ve flown Singapore’s old A380 Suites, Singapore’s new A380 Suites, and Singapore’s old 777 first class. 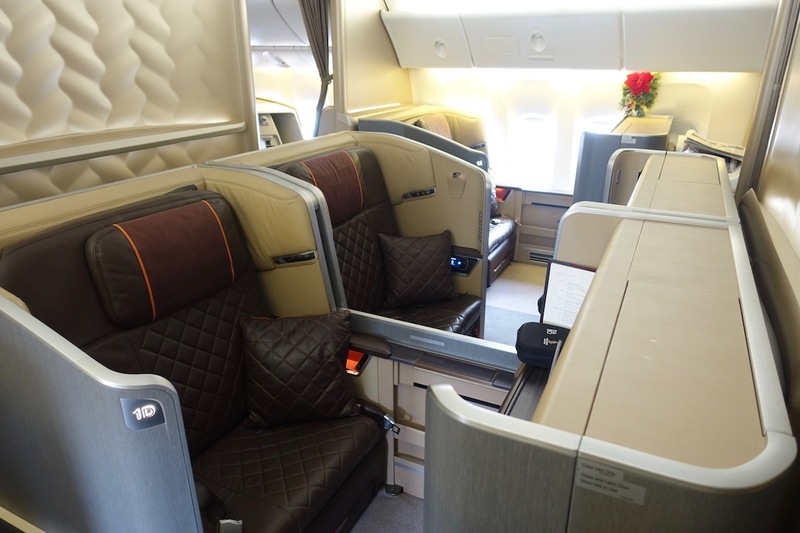 However, nowadays a vast majority of Singapore Airlines’ 777-300ERs feature a somewhat new first class product, which has just four first class seats. 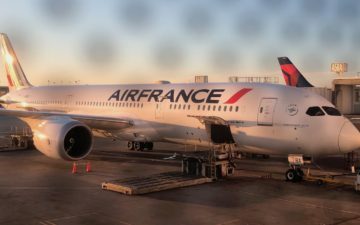 So in this post I wanted to share my experience based on this roughly seven hour flight, with a full trip report to come. Singapore Airlines’ new 777-300ER first class cabin has just four seats, in a 1-2-1 configuration. Talk about an intimate cabin. There are only a few airlines out there with a first class cabin this small, and I sort of love it. I was expecting the cabin would feel a bit claustrophobic, but it doesn’t at all. There’s a big walkway behind the row of seats, so the cabin feels quite large. These seats aren’t exactly cutting edge. They’re super wide, and they have excellent storage, an easy to use and flexible tray table, and a huge personal entertainment screen. However, there are better seats out there. On non-supper flights, Singapore Airlines has among the best catering of any airline. I had caviar to start. Then I had a delicious roasted pumpkin soup with gnochetti pasta. Then I “booked the cook” (where Singapore Airlines lets you pre-order from a huge menu), and had the lobster thermidor. For dessert I had a warm chocolate cake with vanilla ice cream. To drink there was the choice between Krug 2004 and Dom Perignon 2009. What a choice! When Singapore Airlines service is good, it’s the best in the world. Taking care of first class were Jennifer and Benedict, and they were spectacular. Like, so, so, so, so good. Their friendliness, sincerity, attention to detail, and attentiveness, were flawless. I always notice positives and negatives (after all, I’m tres tres picky), but they were spectacular, and I didn’t find a single flaw in their service. Every time I went to the bathroom my seat would be “refreshed” (a new bottle of water would be placed there, my bedding would be folded, etc.). Then when I’d return to my seat, Jennifer would come and tuck me in. And not just like placing the blanket over me, but literally tucking it around my feet. Singapore Airlines has an excellent entertainment selection, and I’d say after Emirates’ ICE system it’s the best in the sky. I was a bit surprised by wifi on the flight. The last Singapore Airlines 777 I took had wifi that was fast and based on the time used rather than data usage. This 777 had OnAir wifi, which is notoriously slow. It was also really expensive, at $20 for 50MB of data. Fortunately first class passengers get 100MB of free data, which lasted me a while. Even though this was a daytime flight, Singapore Airlines offers excellent pajamas and a really nice/quirky amenity kit (I’m not sure what I need a bar of soap or candle for, but I’ll take it), both from Lalique. On top of that there are slippers, eyeshades, and socks. Singapore Airlines first class is damn near perfection. The first class cabin is intimate, while the seats are good but not amazing. But everything about the soft product is industry leading. The food is excellent, and the service is in a league of its own. What a great use of miles. If you are looking to book this cabin with miles, Singapore Airlines often makes two first class award seats available, which is pretty awesome when you consider there are just four seats. If you’ve flown Singapore Airlines’ four seat first class cabin, what was your experience like? Great to know that SQ has still got it? Any thoughts on the quality of Krug 04 vs Grande Cuvée? I know the 04 is more expensive, as vintages tend to carry higher price-points. It really surprises me Singapore (and other airlines) make their seat so hard and don’t give you the option to adjust it. I primarily fly on AC, and their reverse herringbone seats have a pneumatic seat cushion that allows you to adjust the firmness of the mattress. Does anyone know if other airlines have this? It seems like it would be really helpful flying Singapore. My last few flights in SQ FC where OK but not overwhelming. Food generally was OK though. One annoying thing sometime back was crew sitting in the FC pantry and talking non-stop to the extent I could not sleep. This however never happened on any other flight. The seats do not get me super excited but for a 10-12 hour flight will do. The seating is better if the first class cabin is empty and one set is a bed and one seat is a seat. Not fond of the idea of choosing one or the other. Also the gap between the seat and the foot rest isn’t flat resulting in an odd sleeping situation. An excess of blankets and pillows is an additional enhancement if the staff are so inclined. I do think first class is an oasis for both the passengers and the staff. So, how many reviews of SQ first are there on OMAAT? And you dont review premium economy why exactly? All too alike? @ Ben — Wow, I cannot believe this is your first time flying this product since it has been around for a few years. It is great indeed except the rock-hard bedding. It seems like such an easy issue for SQ address. I have flown it twice this year and agree with your assessment. My only hang up is how hard the seat is in bed mode. Other than that is really is that great of a product. Hi, I’m new to mileage programs and just today discovered your site. This was the first post I read. It seems like a robust report but you indicate that a “full report” is forthcoming. This post seems pretty robust. What is it missing? Thanks and looking forward to spending some time maneuvering through your site. Hi Lucky, does the first class in this flight provide wireless headset from B&O? I heard that SQ starts rolling them out thru out its first class product. Ive flown IAH-DME in business and first probably 100 times and the business product is so close to first I really don’t understand why anyone would book first. Same seats, similar food (in fact I used to ask for the business meals because I thought they were better), same cabin feel, etc. I find Singapore Airlines food to be fairly underwhelming in most all classes these days. Nothing wows me anymore. You mentioned you had the lobster thermidor, but you don’t say how that particular dish was. Can you talk about the quality and if you would order it again over the other food options? I preordered the lobster thermidor one time and the FA dropped it during preparation so I had to have something else, so I never actually ended up trying it. Also is the US-SIN route via Tokyo the new or old 777 product? @Bill – US-SIN via NRT will be with the new 777 product. Any 777 that has premium economy has the new cabin products I believe. As to the lobstah’ thermidah’ , I had it in Biz Class from SIN-KIX and it was pedestrian, underseasoned but nothing a little salt couldn’t fix. It’s a good dish and the one in First class I hear is better quality. These are almost copy and paste of each other. I think this blog has run its course. What aspects of which airline would your favorite first class product have? How full was the cabin? Is this one of the best F flights EVER on a Southeast Asian airline? The (unfortunately short-lived) first class on Garuda has some competition. The other problem with the F seats above and all the C seats is the useless leg rest which does not rise above 45 degrees so of no use whatever for sitting back and relaxing. Generally the competition offers something better these days. SQ is so expensive to book full fare even in economy compared with other airlines. Through points it isn’t much better unless you are lucky enough to get a flight segment through a points partner such as AIR CANADA Aeroplan or others. I was lucky enough to fly economy once on partner points and also 747-300 Business Class upstairs flight once decades ago with an industry space available pass (great experience). How about a review of Premium Economy or Economy for SQ since it is one of the top three airlines in the world by many accounts? It’s about all I would ever aspire to and with my hard earned points they would probably go to business on another carrier that is easier to book based on J class availability. How many points did you redeem for the flight? 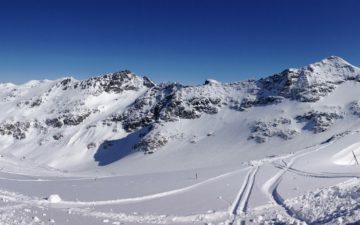 I flew this product last year on a birthday trip. The crew did an amazing job and found some dry ice and sparklers to spice up my birthday cake presentation which was a complete surprise to me, but something my nephew set up for me. It was spectacular and they were so genuine about it. 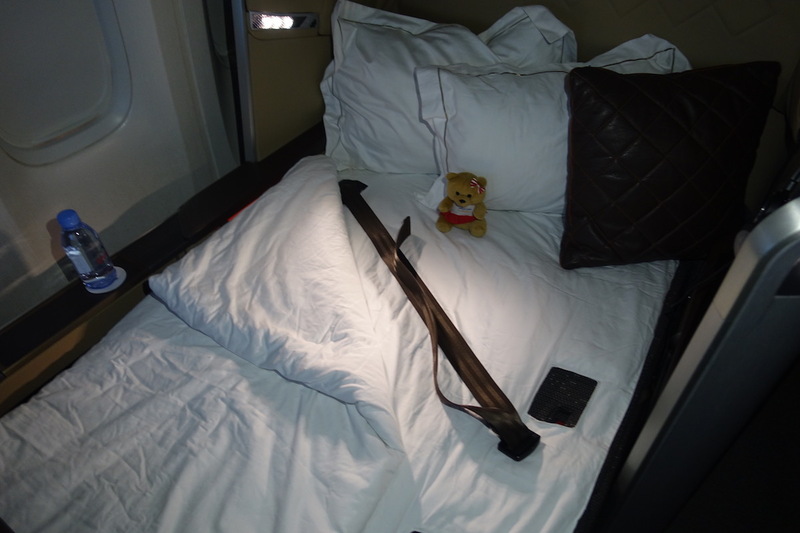 My flight was from Singapore to Dubai and I did not really sleep, but they did set up the bed for me and I did not find it uncomfortable, but probably not as comfortable as Cathay Pacific First which I flew a few weeks earlier. Anyway, the food was indeed incredible and the service, 2nd to none. Glad you enjoyed most of it. Had the lobster thermador; very disappointed as it comprised 3 or 4 lobster (I think) chunks buried in gooey sauce sitting in a half lobster shell. Fairly tasteless, and pretty much a disgrace to SIN catering. How can you determine if your flight has the old or the new first class suites? I am going to fly SIN-AKL round trip in April, and I can’t figure out which version is on the flight I’m looking at (SQ 285). My wife and I just flew this product from LAX to ICN!! It was a wonderful way to spend 12 hours in a plane. All 4 seats were taken, but I never even noticed the others. It was wonderful. I didn’t notice the bed being hard, but I sleep on a hard mattress. I loved every minute of it!! I love a travel candle. I don’t usually travel with one, but some of my friends do, and it’s nice to have something in the bathroom you can light…especially if you’re sharing a room. I love SQ’s first class beyond any other product out there and the service to their Solitaire PPS Club members is exquisite. I find the the firmness of the sleeping surface to be perfect. SQ is our preferred method of traveling across the Pacific. Could the hard sleeping surface be a cultural preference? I notice mattresses at Asian hotels also seem to be harder, even at 5-star international chain hotels. Great use of miles indeed, either as a single flight or as part of longer trip. I had the whole cabin to myself on a morning SYD-SIN flight (connecting to JFK in old suites). Even though the whole cabin was empty, only one seat was available for redemption. 2. Taxi drivers in Singapore do not know about the separate 1st class entrance in T3 (left turn just before the main part of the terminal onto the reddish-colored roadway). I thought I read somewhere that the Book the Cook lobster thermidor in business class is a slipper lobster whereas in first class it’s the proper lobster tail. Anyone confirm? I flew this product on Sunday on the 1:10am SIN-LHR flight and wow what a different experience you had in terms of service. I was never even offered bottled water let alone have it put there and was certainly never tucked in! In bed mode I found it very hard. It was not comfortable at all. I was connecting on from a flight in the old suites class from Auckland, I find that bed far more comfortable. The other problem with the bed on this 777 was that there was a hard lump just below my knee where the seat met the foot rest area. That was very uncomfortable. Personally I would avoid ever flying this again. I usually travel with Emirates , next time i will try dxb to sin on Singapore Airline. 777 Flying DXB-SIN daily? I thought the Lalique amenity kit was only available on the Singapore-Sydney route. I’m flying first on Singapore in June from LA to Singapore to Manila and back. Will I receive the Lalique amenity kit and pajamas or some other brand?